Petflation Update: December – Ready for a surprise? The CPI data for December is out – and it brought a big surprise… The total pet market prices are up +0.14%. It may not seem like much, but prices have fallen in December in 4 of the last 6 years…and this was the biggest increase since 2007. In 4 consecutive years December has brought precipitous drops in both Food and Supplies prices, driving the Total Pet Market pricing down…but not in 2014! All segments are now higher in price than they were one year ago in December 2013. Supplies and Food went up in December for the first time since 2009. 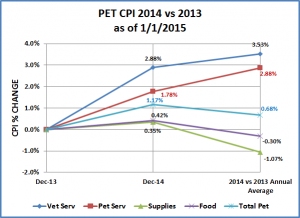 Pet Services were basically flat and the Vet prices increase was half what it was in 2013. Overall result…Total annual numbers inched upward…but still the second lowest increase in history. Vet Service CPI – Up 0.14% over November – 70% less than last year’s increase! Pet Services – Down -0.01% from November – Essentially Flat; usually up 0.2% or more. 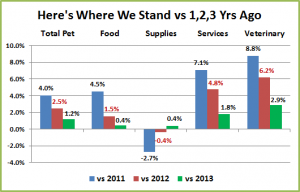 Pet Supplies – Up 0.09% over November– Last year down -0.75; A big turnaround! Pet Food – Up 0.1% from November – Last year down -0.44; More than a 0.5% difference. 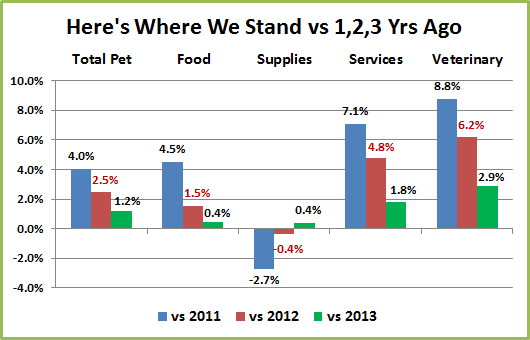 Total Pet -Up 0.14% from Nov. – Last year down -0.25%; Food & Supplies made the difference. 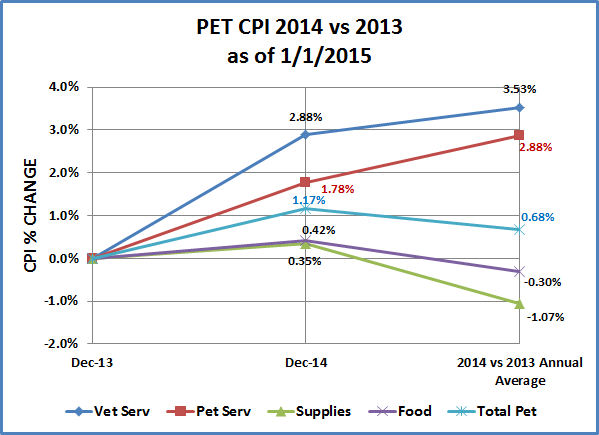 The Total Pet 2014 CPI trended up in the final quarter and finished at +0.68% for the year. This was primarily “fueled” by increases in the Supplies Segment. The Service segments slowed their rate of increase and Food Prices have become essentially flat. 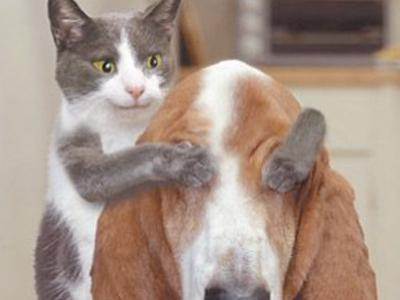 Pet Services – Prices are 1.8% higher than they were 1 year ago. The increases have slowed in recent months. Most of the 2014 price increase was in the first 6 months. Unlike all the other Pet Market segments, Services hasn’t hit a “pricing wall” resulting in slowed consumer purchasing…yet. If it can maintain an annual increase in the 1.8% – 2% range “real” growth in the amount of services should continue. Vet Services – Prices are 2.9% higher than they were a year ago. However, driven by early, substantial increases, the annual increase was 3.53% – almost a full percentage point higher than each of the last 2 years. Although retail sales have gone up, the actual amount of Veterinary Services provided has been essentially flat since 2010. In the second half of 2014 the price increases slowed considerably. If this segment can keep this “second half model” and annual price increases are in the 2.4% to 2.6% range, “real” growth should increase. Services Total – Over the past 20 years, the price increases in the service segments have been almost a mirror image and always headed up. In fact, since 1999 the cost of Veterinary and Non-Veterinary services have more than doubled. It’s time to slow down. Pet Food – Pet Food prices are 0.42% higher than they were a year ago. Although they have generally been down most of year generating an overall decrease of -0.3%. A price decrease in Food has happened 2 other times – in 2000, down -0.1% and in 2010, down -0.38%. Food Pricing was definitely a roller coaster ride in 2014 right up until October. In the last quarter, prices flattened out and unlike the 5 previous years, there was no December price drop. This largest segment of the market has become even more competitive. With the consumer looking for value, the food segment comes up first on everyone’s comparison shopping list so price is a major issue. It looks like the food segment could support a rise in the2015 CPI in the 1.5% range. Pet Supplies – Prices went up 0.09% in December, which is miniscule. However, when you consider that prices dropped an average of -1.1% in the last 4 Decembers, it’s is quite a turnaround. The December prices in 2014 are actually 0.35% above what they were in December 2013. Of course, prices overall fell -1.07% in 2014. But it could have been much worse. Before they started up in September, prices were projecting an annual drop of -1.5%. The September increase was a bit extreme at 1.4% but the final quarter brought moderation…and no precipitous drop in December prices. The supplies segment is more prone to seasonal pricing fluctuations so even if it gets back on track, it will never have slow moderate monthly increases. It will always be a “roller coaster” ride. However, if the extremes can be mitigated and the deflation stopped it will be a much healthier environment for all concerned. This segment is highly competitive with a huge number of “players” a CPI increase in the 1.0% to 1.5% range should support healthy growth. Pet Food & Supplies – These segments are about 0.26% above where they were in December 2013 but they finished down -0.79% for the year. This was just slightly less than the -1.04 drop in 2010. However, that drop came after price increases in 2008 & 2009 totalling an amazing 16.9% – at the depth of the recession. Since 2010, prices have gone up only slightly. It appears that a combined annual increase in the 1.4% to 1.6% range would be reasonable and be supported by consumer growth. Total Pet – Prices are 1.2% higher than they were 1 year ago in December 2013. For the year, prices were up 0.68%. Only 2010 at 0.62% had a lower increase and actually no other years have been below 1.4%. The consumer products market has become incredibly sensitive to pricing since the great recession. Priced to high and consumers look for alternatives or just buy less. Price deflation can also bring trauma to a market because of the pressure it puts on both retailers and manufacturers. So what is the “sweet spot”? 2014 was not a typical year and we wouldn’t want to repeat it’s wild swings. However, the last quarter of the year, with moderating prices in the service segments and slight increases in the Products side could be a good “role model” for the future. 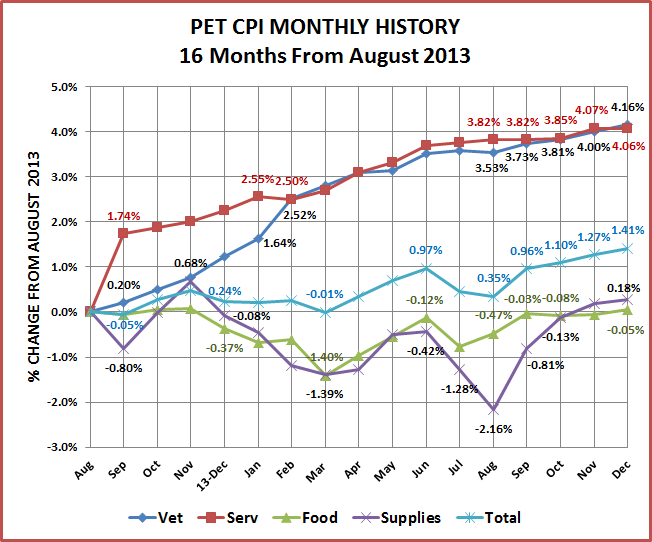 It would seem that an annual increase in the 2015 Total Pet CPI in the 1.5% to 2.0% range would be ideal. We’ll see what 2015 brings!